"Who was that let you off at the gate," asked Olivia. "It was Miss Emma and Miss Etta," said Clay-boy, holding out a Mason jar of the Recipe. "They sent this. Said it was Christmas cheer." "It's bootleg whiskey is what it is," observed Olivia. "What do you want me to do with it, Mama?" "I'll take it," said Olivia..."I can use some..for my applesauce cakes." When fall rolls around, most people jump on the pumpkin spice bandwagon. You can't throw a rock without hitting a product that has this flavor; pumpkin spice doughnuts, pumpkin spice pancakes, pumpkin spice coffee, pumpkin spice chocolate covered pretzels...you get the picture. I like pumpkin flavored items just as much as the next girl, but is that the first fall flavor that comes to mind when I think of fall cooking? No, says I. I'm all about the apples! Now I like apples year round but I want to make more apple recipes in the fall and winter months. 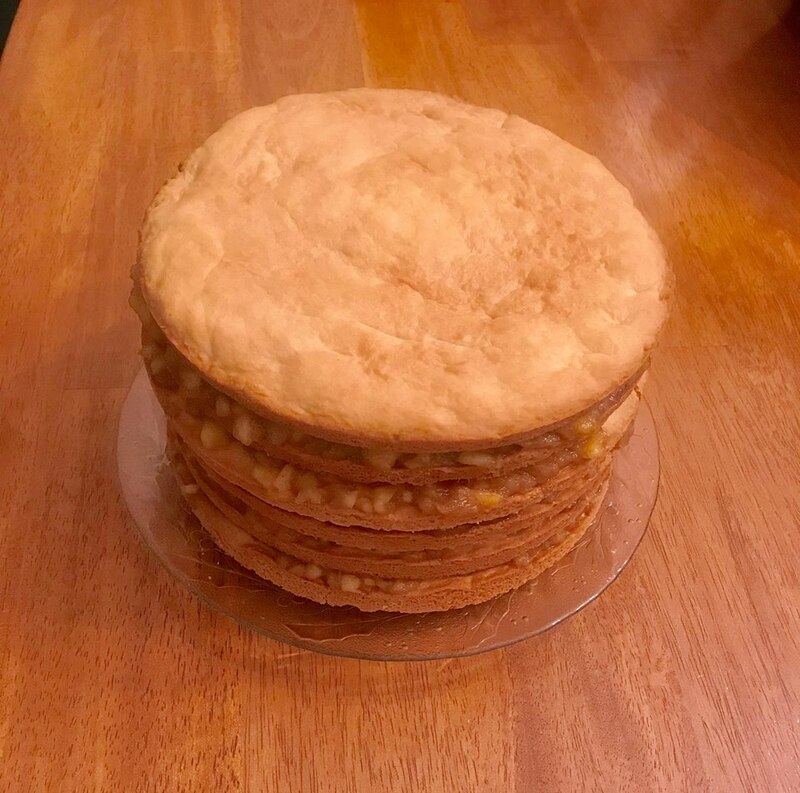 While there are many apple desserts that are common place in my part of Appalachia, none can be more rooted in our mountain culture than the Appalachian apple stack cake. 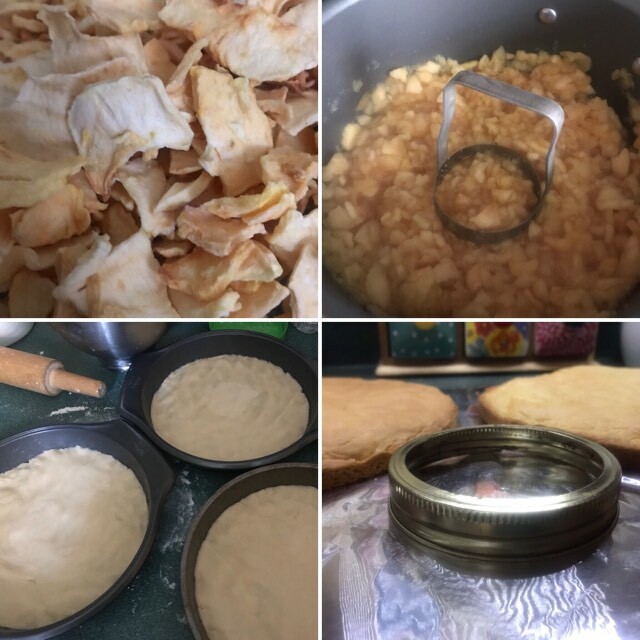 Sometimes called by other names such as Confederate old-fashioned cake, Kentucky pioneer washday cake, and applesauce cake, it is traditionally made up of layers of pancake thin cake and filled with stewed dried apple filling. It is then refrigerated for at least a day or two to allow for the apple filling to saturate the cake. Doesn't that sound heavenly? I knew that this had to be on my family's Thanksgiving menu this year. Before I get into how I made my cake, I want to share some of the resourcefulness and a little history behind this regional delicacy. As I've mentioned before, Appalachian women were very resourceful. They had to be! I think this dessert is a perfect example of that resourcefulness. Apples were plentiful throughout the mountains in Appalachia. A great way to preserve those apples was to dry them. I could write a whole blog post on dried apples, and probably will at some point, but won't get into that right now. Plain applesauce (or apple butter) can be used as a filing but dried apples offer a much richer flavor and was the choice of most mountain cooks. Most old recipes that I researched also call for sorghum molasses or honey. This was also a resourceful sugar alternative that was available in the area. The rest of the main ingredients (flour, salt, shortening/lard, eggs, milk/buttermilk, baking powder/soda) were also economical staples that most women had on hand. Unlike Mrs. Olivia, I didn't find any recipes that called for any "Recipe" but that isn't to say that some didn't use it. From what I've read, the history of this cake is debatable. Some credit James Harrod, an early pioneer of Kentucky and founder of Harrodsburg, as the one who introduced this recipe to Appalachia. Some try to give all of the credit to Tennessee. Regardless of how it got to Appalachia, it's origin is probably based on Eastern European tortes. 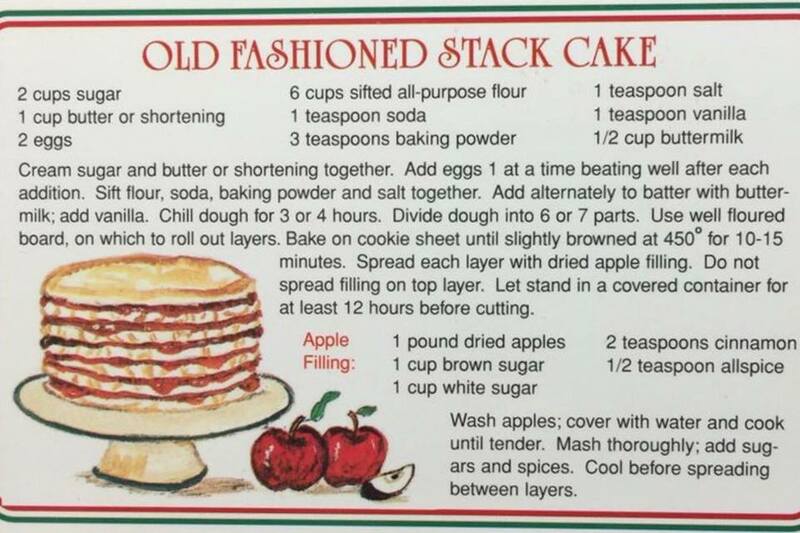 According to the Encyclopedia of Appalachia, "The dried apple stack cake was a favorite pioneer wedding cake. Weddings were celebrated with "in-fares," where people gathered to party, dance, and eat potluck food. Because wedding cakes were expensive, neighbor cooks brought cake layers to donate to the bride's family, who cooked the dried apple filling. The bride's popularity was often gauged by the number of layers, but the average was seven or eight. Stack cakes were also at family reunions, church supper, Christmas dinners, and other large gatherings." The wedding history is my favorite idea associated with this cake. If I could go back and do my wedding over again, I'd choose this for my wedding cake. I've had the opportunity to sample different versions of this dessert at reunions, church potlucks, and other gatherings but this was my very first attempt at making one. Why? Anyone who knows anything about baking could look at it and tell that there's going to be quite a bit of time invested. A labor of love, if you will. I'm going to be honest. As I was rushing around to make other things on our menu I didn't devote as much time to making it as I should've. I did use the traditional dried apples and cooked them a long time to get them just right. The cake layers is where I slacked. Instead of getting my layers as thin as I should have, I decided to try to rush the process and only do six thicker layers instead of the 7-8 that I had enough dough to do. Don't be like me. Take the time to make the layers as thin as possible. The dried apple mixture can soak into thin layers MUCH better than thicker ones which makes it SO MUCH better. I'm also wanting to use a cast iron skillet instead of cake pans next time to see if it really makes a difference. I guess I could try cast iron cake pans if I had them but I don't. Almost everyone has a cast iron skillet or two and if you don't, why the heck not?! What do you make your cornbread in?! And don't you dare tell me that you don't eat cornbread. I don't need that kind of negativity in my life. Cast iron cooking will change your life. Okay, that may be a little dramatic...no it isn't. Life. Changing. As for recipes, I used one that I found online and there's no source to credit it to. Thank you, whoever you are! Just click right on the picture if you need to enlarge it. Tips: You'll need to add water as they cook down. Keep adding and cooking until you get a applesauce consistency. I left mine a little chunky but not as chunky as they are in this picture. See that little chopper in the pic? That thing is super handy in helping the apples fall apart. This recipe says to roll out your dough and you can even see my roller (that my dear husband made me) in the pic. This is unnecessary if you're using cake pans or a cast iron skillet. Just flour your hands, pinch off some dough, and spread it into your flour and greased pan. Just use enough dough to make a thin layer over the bottom of the pan. You're going to think, this isn't enough, but you're wrong. Pat it as thin as possible or you'll end up with thicker layers like the ones in my picture with the canning ring. It looks pretty thin and they are thinner than the ring, but trust me, it should be thinner. There will be some rising so make it THIN and then the apple filling can saturate the layers better. If you decide to roll it, go for no more than 1/4" thickness. This recipe says to let stand at least 12 hours. I really don't think that is long enough. Store it in a tight container and put it in the refrigerator for at least a day or two. Trust me...and another benefit of that is, you can make it ahead of time! not being thin enough but it was still delicious! 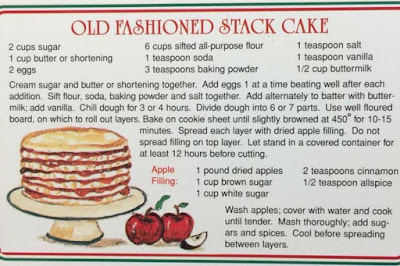 Have you ever had an apple stack cake? What do you call them in your neck of the woods? Leave me a comment and let me know. I loving hearing from y'all!